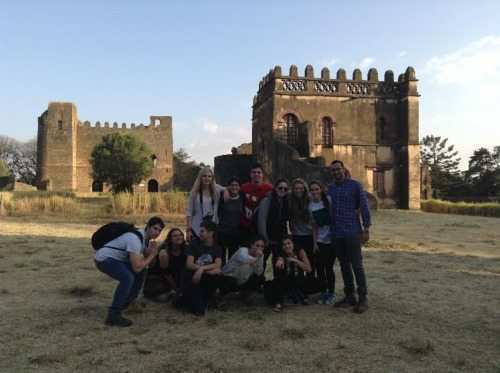 We all arrived safe and sound to Gondar which is an amazing looking city. We got a taste of Ethiopia a little earlier than expected. After our arrival to Addis Ababa the receptionist who was supposed to welcome us in immigration, and to stamp us in, was nowhere to be found. After all the commotion the passengers caused, the guy finally arrived but two minutes too late. Yes…the plane had left without us. I was not too happy about it to say the least. On the positive note, the students did not seem bothered at all. I’m sure they were frustrated to some extent but they did not let it ruin the good vibes. They kept laughing and cracking jokes, falling asleep and waking up. At a certain point something happened that made everything better, we were taken to the business lounge. That meant some good food and drinks but most importantly free wifi. We blended right in with the sophisticated businessmen and women in the lounge. After all this nonsense, I can safely say today was a day that will live in the memories of your kids for the rest of their lives. 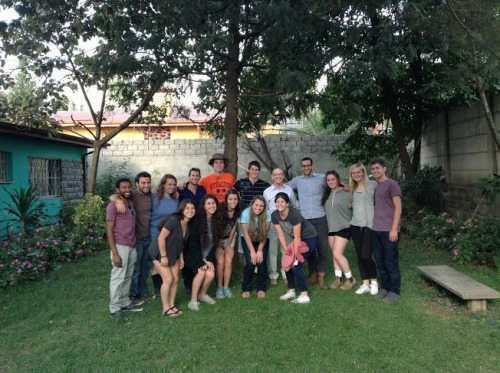 We landed in Gondar, a tiny airport in Northern Gondar, met our guide, driver and Dejene Hodes (graduate of the program and now running heritage tours to Ethiopia) and started our journey. The culture shock started as soon as we left the airport. Just looking out the window at the mud-huts, tuk-tuks, the way people were dressed, the amount of people walking in the middle of nowhere was an extremely eye-opening experience. We saw kids filling up water tanks from a well pulling water out to take to their homes. 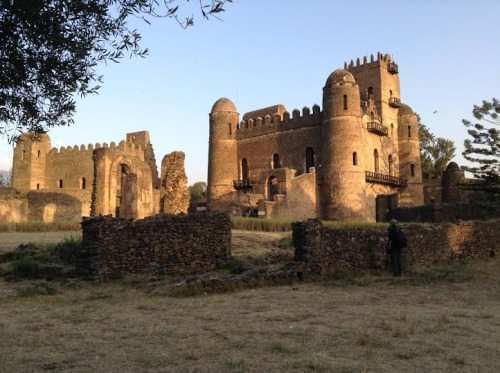 We visited the Royal Enclosure of Gondar, which was the capital city for 200 years. Each emperor built his own castle within the enclosure. We explored the castles, saw something different in each one and its stunning architecture and once again. There were Magen David’s everywhere (in the royal castles. They were pretty spectacular, plus we got to see two wedding celebrations and some live music on a Masinco (a one string violin). As soon as we checked into our hotel there was another HUGE wedding celebration in the lobby and pool area. Finally we had a traditional evening, which included amazing local food, Gondar dress, music and dancing, more coffee and Tej, a honey wine/beer drink. It was a lot of fun and many brave souls in our group joined in the dancing. We’re still working on moving our bodies and shoulders the same way as the locals while dancing. It’s surreal and beautiful. I think Shira has some Ethiopian genes she doesn’t necessarily knows about because she dances like a true local! 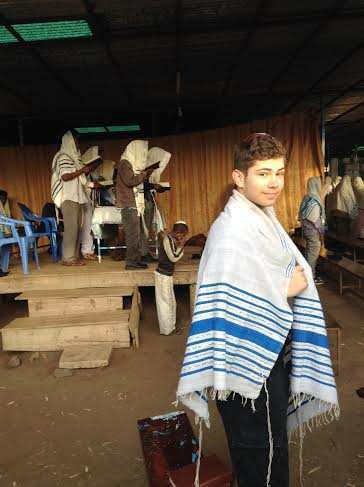 We started the day with a trip to Shacharit (morning prayers) with the Gondar Jewish community. As it was Monday it was Torah reading day, so we got to see them take the Torah out and then read Parsha in Amharic. There were well over 80 people at the minyan, at least half of who were women and many were children. To see people with such devotion to the Torah and daven with such Kavanah was a very uplifting experience. The prayer was partly in Amharic and partly in Hebrew and the walls had different hand written sines in Hebrew like a Bnei Akiva sign telling about the next gathering. It was a very unique experience for all of us. 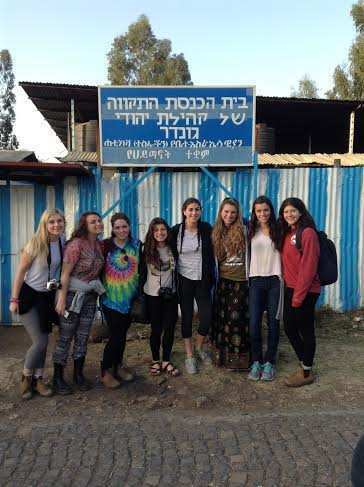 Kobi mentioned that they were praying to get to Jerusalem, something that the group is actually fulfilling this year. We then continued onto the Semien National Park. The drive itself was part of the experience. Everyone was excited at the prospect of being able to sleep on the way up there, but the journey itself was captivating and nearly everyone stayed awake for the majority of the trip. 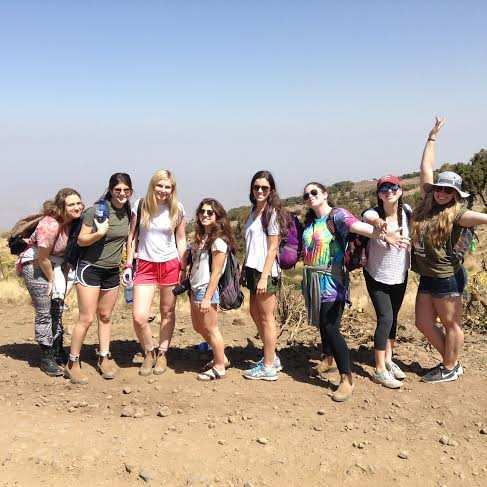 The views were breathtaking and we got to see how Ethiopian agriculture operates. We drove through towns, villages and countryside. Much of the time we were slaloming our way through people, donkeys, cows, sheep, goats and all manner of other obstacles and 1/3 of the journey was on a dirt road. Eventually we arrived at the National Park, one of the most spectacular landscapes in the world and listed by the UNESCO as a world heritage site. The Semien chain of mountains is the steepest and most precipitous on the continent and is often compared to the Grand Canyon of Arizona. 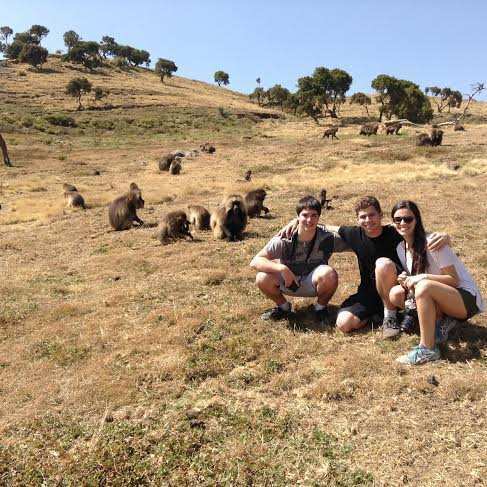 We had a nature walk along the escarpment with a local guide and took in the breathtaking views and saw some of the wildlife, specifically the gelada monkey. We spent some time watching the monkeys in their natural habitat, which got even more interesting when some fights, and high speed chases, broke out amongst. But don’t worry, they gave no cares that we were around; they were more interested in eating their grass and increasing their population. We then started the long journey home. The hike at a the high altitude (3250 ft about sea level) was quite draining. Although on the way back, we did stop off at a tiny Jewish village (Falashas village) where the children were very impressive salespeople, tugging and pulling at our clothing, holding our hands, asking our names and where we’re from , generally just knowing how to open our wallets for them. It was adorable. The children of the village absolutely loved the shenanigans Ian was doing with them. When we got back to our hotel, most people sat around the pool and relaxed, watching the sunset until dinner. 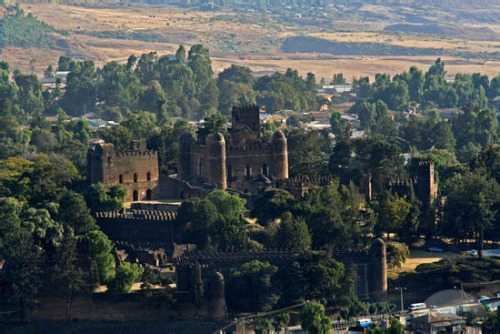 Today we left Gondar and flew to Lalibela. It was the shortest flight any of us had ever taken and we landed almost as soon as we took off, though that didn’t stop many of us from sleeping right through it. We left the airport and immediately were met with a dramatic landscape, totally different from Gondar. It looked much more like a mountainous, desert landscape and absolutely stunning. 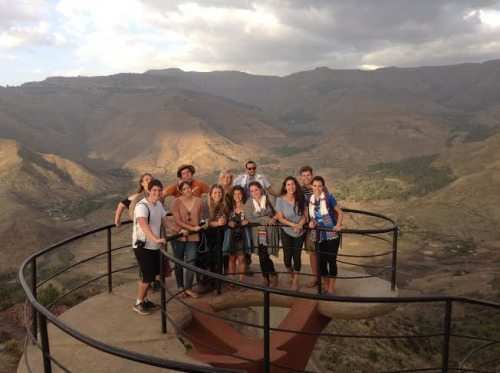 We drove up the mountain to the town of Lalibela and checked into our really nice hotel, where we are staying in comfortable, rooms with balconies and sweeping views of the valley beneath us. We checked in and immediately left to explore the number 1 site in Ethiopia and it’s very easy to see why it’s the number 1. Civilization of the past is still alive in the form of strange and beautiful monuments and ruins. 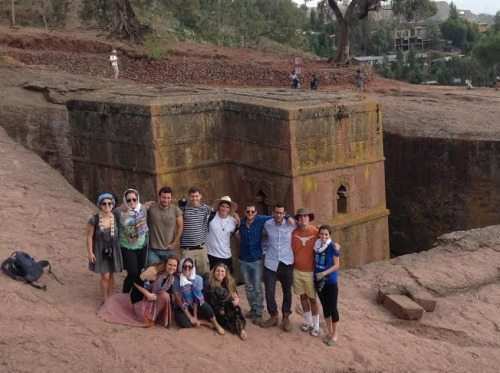 The 11th century rock hewn churches of Lalibela reveal a marvelous and skillful architectural knowledge of the past. These incredible edifices remain places of living worship to this day and no one visiting here can fail to be stunned and awed by the remarkable human achievements that the churches represent. There are 11 churches in total and they are all built out of one single rock or mountain and connected with underground tunnels and trenches. We even made our way through one tunnel known as hell without any light whatsoever. We took a million pictures but I am not sure they do the site justice. We also took some pictures with some priests and explored as much of the site as we could in the time allotted. It was extremely impressive. In the middle we grabbed some lunch where some of ate way too much of the local cuisine. However, probably the most random event of the day happened when we rolled into town to check out the churches in the morning and the whole city center was packed with people due to a high priest dying just mere hours earlier. There was chanting, marching, and a lot of crying. It was quite the sight to see; a whole community coming together to remember and respect someone they all loved. We then headed to a funky restaurant overlooking the gorgeous vast nothingness to watch a stunning sunset where we spent the first part of the evening. The views were incredible, and Jonah and Kobi even time-lapsed the whole sunset on their phone, which was really quite beautiful. While we were watching the sunset on one side of the restaurant, the moon rose behind the mountains on the other side of the restaurant. The stars came out and we were surrounded by darkness, except for thousands of stars. It was very special. After this we had dinner at the same restaurant and then proceeded to our hotel for a quick shower. After we finally smelled human again, we went to local bar with traditional singing and dancing. We had even more tej, the traditional honey wine, and nearly everyone got up to dance at some point in the night. It was quite spectacular. Everyone seems to be getting the hang of Ethiopian dancing where it’s specially all in the shoulders. The entertainer of the night loved to pick on Maya while we were sitting in our booth catching our breath, and then moved on to Abby, Shira and Alena for a bit. Luckily we had DJ, our guide, there to translate all the jokes. But as funny as that was, nothing compared to Ian dancing with the locals while they were all filming him. His dancing was a perfect example of confidence taking you very far. And he believes his confident dancing will take him to be an Ethiopian YouTube star. Tomorrow we continue to Addis Ababa, and thank you for being patient with eye pictures. Wifi just isn’t what we’re used to. We flew into Addis Ababa this morning and began to discover the city. Founded in 1886 by Menelik II, Addis Ababa in Amharic means “new flower,” and it is a giant city full of people everywhere you look. It was the closest we have been to civilization since we have been here, but still 90% of the roads are no more than dirt paths. We got to our hotel and left to meet Dr. Rick Hodes who operates in Ethiopia for the past 21 years. Dr. Hodes was the doctor for the Jewish Ethiopian community in operation Solomon in 1991 and was the subject of four documentaries. He is also the father of Dejene, our trip coordinator and Aardvark alumni. Dejene was adopted by Rick when he was 12 and was sent to Dallas to get his spinal cord straightened under Rick’s medical insurance. Dejene has 4 more brothers that Dr. Hodes adopted in order to treat them under his medical insurance, and other than them there are currently 17 kids that are in need for an operation or medical attention living under Rick’s roof. So naturally, we came with many treys of pizza! While we were waiting for Dr. Hodes to arrive we sat down in Dejene’s old living room to eat lunch with the kids. Jonah entertained the group with some pretty impressive card tricks that everyone seemed to like. We spent four hours in Rick’s house looking at presentations of the patients he’s treated over the years, including Dejene’s case, and hearing stories about his work. The group did not stop asking questions. One thing that he said was that in medical school you are taught to maintain a certain distance between you and the patient, something he fails to do. During operation Solomon Dr. Hodes was working on getting patients from the hospitals so that they would be able to get on the plain to Israel on time. He had some amazing stories on how he basically smuggled certain patients so that they could continue their treatment in Israel. All that’s left to do after hearing such a man speak is to take a good look at your life and ask, am I doing enough? Meeting the kids that Dr. Hodes treats also helps to put your life in perspective. Gil told me half laughing/half serious that his back was hurting from sitting on the couch for two houses while Rick was speaking, but felt embarrassing saying anything. Once we left, exhausted from inspiration, we strolled through the streets of Addis back to the hotel. After taking a shower, and relaxing for an hour, we went to dinner in a very cool dinner theatre. The show taking place during our authentic Ethiopian meal had dancers and singers performing locals songs in different styles from around Ethiopia. We recognized the certain Gondarian dance style from the show we had been in on the first day of the trip. 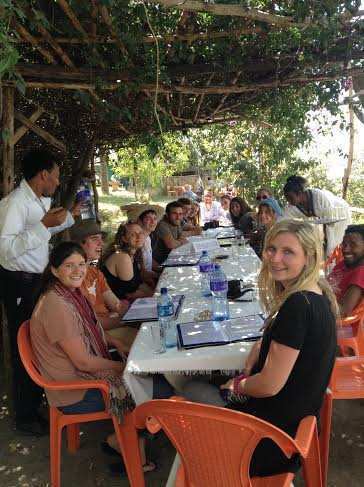 I also noticed we all got much better in eating the Ethiopian food with the ingira bread as well; everyone was getting their hands dirty and trying different foods from each other’s plates like the locals do. After the restaurant, most of us stopped for a nice dessert of cake at a bakery near the hotel. Afterwards part of the group continued to a local bar for some more dancing, while the smart ones went back to the hotel to sleep. We have one more in Ethiopia and I’m not sure anybody is ready to leave. It’ll be a tough goodbye, but someone has to do it. Day five started with a well-deserve late morning where we met for breakfast at 9am. And trust me, I never thought I’d say 9am is a “late” morning. Upon finishing our meal we loaded into our bus and headed to the National Museum. Now this place was something special. It was filled with bones, jewelry and other miscellaneous treasures that have been dug up in excavations sites around the country revealing the rich history of the land. This is even the home of Lucy. If you’re unaware of who Lucy is, or think I’m talking about your friend Lucy who comes over and never stops talking about her current fling with some guy named Rick, then I’m here to learn you a little something. I’m choc-full of knowledge now. Lucy is actually known all around the world as the oldest upright-walking skeleton on earth; about 3.2 million years old. With the hundreds of bones that were found, making up roughly 40% of the total skeleton, we learned that scientists now know that she was able to climb and live in trees, but also walk on two feet like human beings do now. Interestingly enough however, though she is known as such, and for good reason, there was actually one other skeleton named Salam in the museum that was 3.3 million years old and believed to have also been able to walk on two legs. Scientists and researchers say that Salam was about 3 years old when he died, and Lucy was roughly 24 years old despite her tiny stature, but hey, the height has worked for my cute little mother. And it’s even more ok considering the whole museum was the size of a large apartment. After the National Museum we headed to a second museum which actually used to be the home of the emperor in the early 1900’s. As we walked through we saw his original bedroom, and bathroom, suits and general wardrobe. 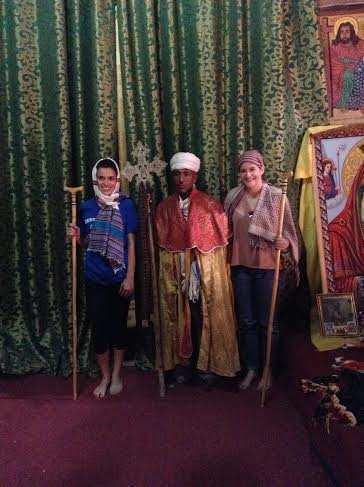 It was very all very interesting because, due to the sheer size of the whole building, we also learned a lot about the Ethiopian history and culture through ancient instruments, pottery, tools, folklore and tribal customs. Julia even read one of the stories that were passed down from older generations and told us later the whole thing while we were waiting at the airport. After this museum we went out for lunch and one of Ethiopia’s oldest hotels, where some ate traditional food, and some got pizzas with traditional toppings. 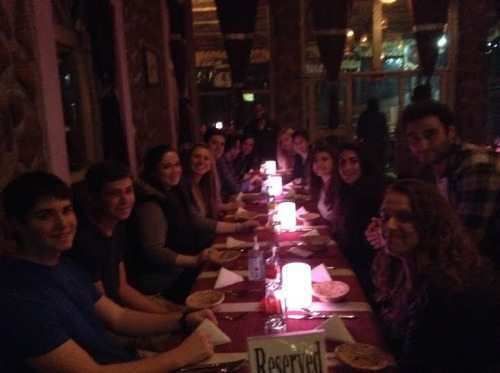 The nice thing about this is once everyone was finished eating there were still about 2.5 pizza left untouched. The students had the brilliant idea to package them up and give them to children on the street. It was very nice, Jonah and Danielle seemed to head up, and execute, this idea. Once lunch was finished we hopped back onto the bus and headed towards the Israeli embassy. Once there, the security took everybody’s phone, except for the one phone that was allowed to take pictures. The most surprising thing? Nobody even complained when the phones were taken away, I was stunned. But we got inside and we had a very nice chat with the Israeli ambassador to Ethiopia. Everybody was asking her questions and clarifications, and it really felt like a discussion most of the time as opposed to just a Q&A session. We talked a lot about getting the Ethiopian Jews the right of return and moving them to Israel, why they want to go, the logistics of getting them here, and how Ethiopia is viewed to the rest of the African countries because of their strong, positive ties to Israel. We all got a very beautiful group picture with the ambassador that she even wanted me to email her. Anyway, after this big day we headed for dinner one last time before heading to the airport. We stopped off at this pure-meat place where we got 5 plates of fresh beef, with a kilo of meat on every plate, for everyone to eat. It. Was. AMAZING. However, as incredibly delicious as it was, the pasta that Alena and Danielle got didn’t look too shabby either. It was a great last meal in Ethiopia, and a perfect way to end any good day. And finally before I say goodbye, I must announce the student who received Aardvark Top Traveler for this trip. If you don’t know what this is, its a silly little recognition we give to the student who handles every trip with grace, humor, charisma, interest, and overall positive attitude. The difficult part, however, was that each individual in this group could have EASILY received this, so you can imagine how much we had to talk about it. BUT THERE CAN ONLY BE ONE! And on this trip, this student kept our energies up even when we all were exhausted, he interacted with almost every local he came across, even exchanging emails with many village children, he seemed to have gotten a grasp on the language in the first two days, always asked great questions to speakers and guides along the way, kept everybody in stitches from laughter throughout the week with his “Improv!”, and was just a positive energy for our whole group. The Top Traveler for this past week was…*drum roll*…Ian Kornfeld!